Are you tired of ropes fraying and falling apart during shows? Who wouldn't be at the end of their rope when props unravel? This little white bottle puts an end to fraying. Just dip the ends of the rope into the solution and let dry. Problem solved! The End of Your Rope Solution is not glue. The clean finish keeps dirt away and will last for hundreds of shows! - Fast and easy to use! - Over two ounces of Solution! 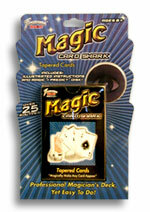 - Perfect for working magicians! - Bottle wrapped in color label. Special Bonus Included! With Tenkai's Neck Tie Trick you'll be able to tie a rope around your neck, and with just a few magic words pass the rope right through! I admit I was a little leary of this- would it change the color of my rope somehow? Nope- it's doesn't do that at all. Let it dry for a day or two and the ends of your ropes will never drive you crazy again. Highly recommended. Simply enter your details below and we will send you an e-mail when “End of Your Rope Solution” is available to ship!